With some creative thinking and clever upcycling, Val and Norman Rennie have transformed an unloved cottage into a dream rural getaway. Read on to find out how Val and Norman breathed fresh life into this gorgeous cottage, then browse the rest of our real home transformations. Read our guide on renovating a house, too, for more guidance. For many, location is the driving force behind buying a holiday home, whether in a favourite destination that holds happy memories or somewhere you’ve always dreamt of going. But when Val and Norman Rennie set out to buy their second home four years ago, they had no idea where to start looking. ‘It was just a case of seeing what was around,’ says Val. One thing, however, was clear: having lived in an industrial port town on Teeside for most of their lives, the couple were itching for a taste of country living. While its exact location had yet to be decided, the couple had a clear vision of the type of property they were after. A traditional Belfast sink adds to the country feel, as do the floral print blind and cushions made by Val from old Laura Ashley fabric. However, with a tight budget and a plan to carry out all the work themselves, the couple were aware that the project had to be achievable. ‘Norman had been in the building industry previously and will pretty much put his hand to anything. When I set him a challenge he doesn’t usually disappoint!’ laughs Val. After an 18-month search for the perfect location that stretched all the way from Northumberland to Wales, the couple eventually realised that somewhere closer to home was the most practical solution, ideally within an hour-and-a half’s drive so that they could easily manage the project. Val and Norman finally settled on a property in a small market town in Weardale, County Durham, on the edge of the North Pennines. ‘We’d never actually heard of it before, but it’s only 50 minutes’ drive away. It’s close to the River Wear and surrounded by woodland, so it’s ideal for walking.’ Having stood empty for two years, the house was in a sorry state. ‘The paper was falling off the walls, it was damp and decorated in brown,’ Val recalls. ‘But we didn’t mind, as we could see its potential, and the fact that you couldn’t live in it while the work was being done was not a problem for us.’ From their first visit, it was obvious what needed doing. ‘We basically went in and gutted it. The carpet came up, the plaster came off and we took it right back to the four stone walls and started again,’ says Val. The first things to go were the ugly false ceilings upstairs, which, to their delight, uncovered a characterful, beamed roof structure. Opting to leave the whole upper storey open to the rafters, Norman then reconfigured the upstairs to maximise the space, creating a master bedroom, guest bedroom and bathroom, which had originally been downstairs. 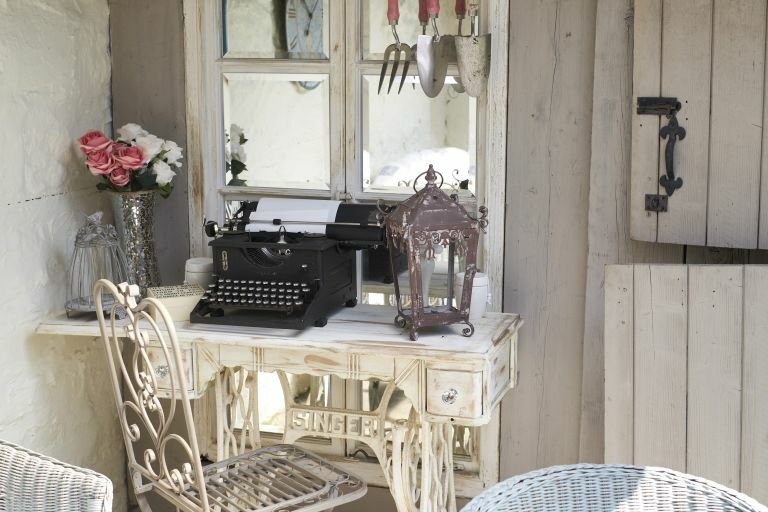 The feature is just one of many reclaimed finds in this house, which is a catalogue of upcycling inspiration. The kitchen, for instance, started life as old wooden doors found on Ebay. ‘We bought 13, stripped and painted them, then simply found carcasses to fit,’ says Val. ‘We also found an old dresser top on Ebay, which fitted perfectly into the recess by the window. It was much cheaper than buying wall cabinets and the glass front helps reflect light into the room.’ Add into the mix reclaimed and repainted chairs, a secondhand Belfast sink, an old pub table and handmade textiles, and Val has shown that a characterful country-style kitchen can be achieved on a shoestring. By Easter of 2014, the project was complete and it seems all their hard work and patience has paid off, as the couple couldn’t be happier with their new rural retreat. ‘Norman wanted to do all the work himself and I’ve had my heart in my mouth with some of the things he was tackling, but it’s pretty much gone to plan, and looking back we wouldn’t have done anything differently,’ says Val. In the meantime, the couple take every opportunity to visit, travelling down most weekends and embracing life in the country. ‘Since completing the project we’ve bought a puppy, Hugo, so we’ve got a companion that comes down with us now, and he loves walking over the fields,’ says Val.